...we were back on a wild stretch of coast. 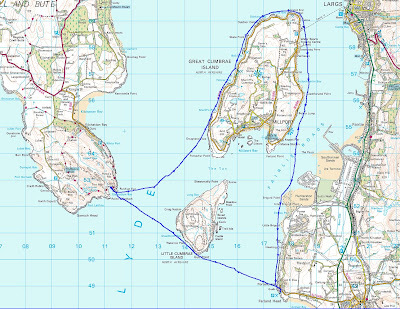 The Three Sisters of Hunterston were formed during the current Holocene period, when brash ice erosion rapidly cut the cliff line as the land rose at the end of the last ice age. 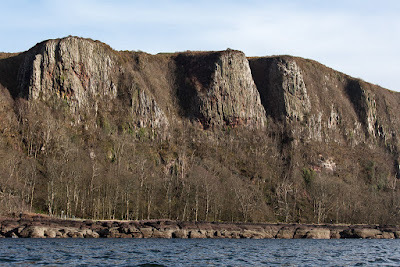 Once the ice melted, the land continued to rise but the rate of erosion slowed leaving a rock platform at the base of the cliffs. Caves in the cliffs were inhabited as the area was populated following the retreat of the ice. 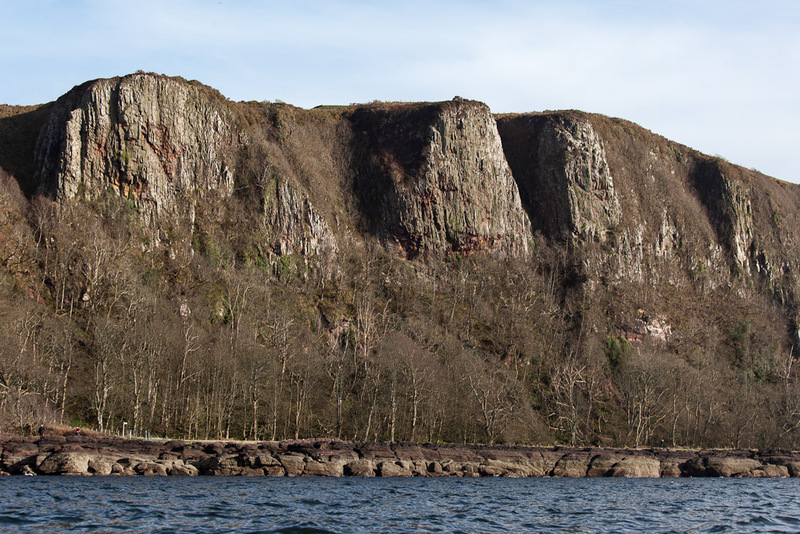 The stunning Hunterston brooch was found here in 1830. It dates from about 700AD and is finely worked in gold and silver with amber decoration. 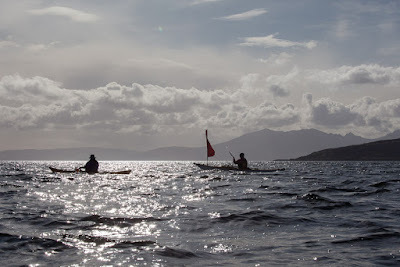 As we approached the end of our paddle, Colin and Andrew were somewhat overheated from keeping up with the kayak sailors. 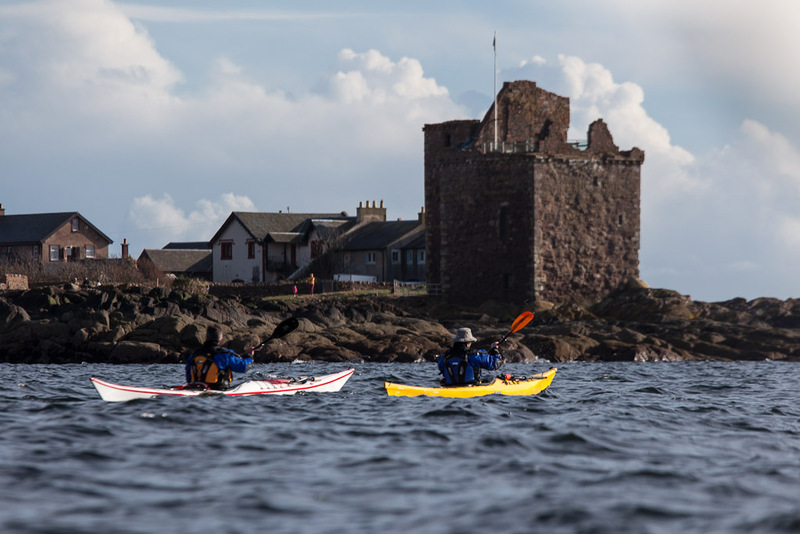 As we approached Portencross Castle, Andrew asked me "How's your roll?" As I was looking forward to it with some relish, I said that it had bacon, lettuce and tomato with a thin spread of mayonnaise. 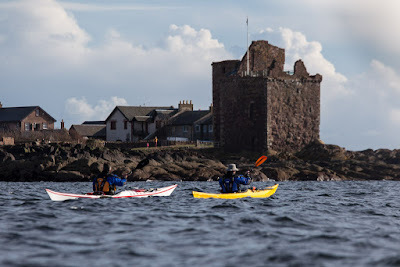 Then, as Mike, Phil and I landed, Andrew and Colin cooled themselves with lots of rolling and thrashing about in the icy water. 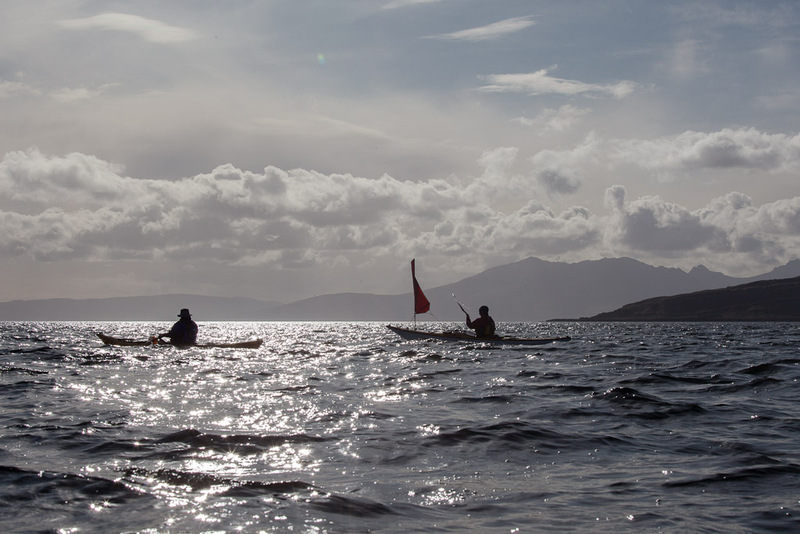 I watched them as I munched my roll and I realised that sea kayaking encompasses a very broad church of activity. 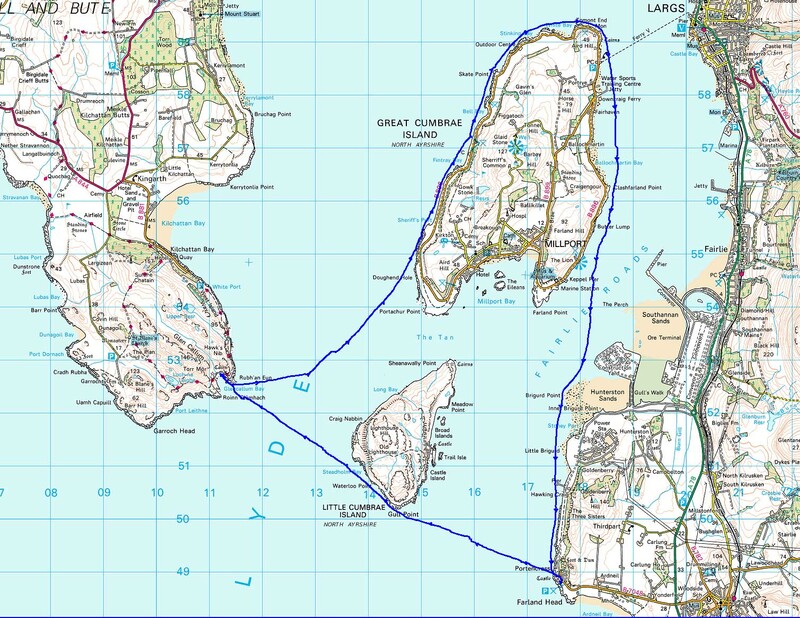 The shift in wind from SW to NW and our choice of launch site in the SE meant that we sailed the whole of this 30km circumnavigation of the Cumbraes. 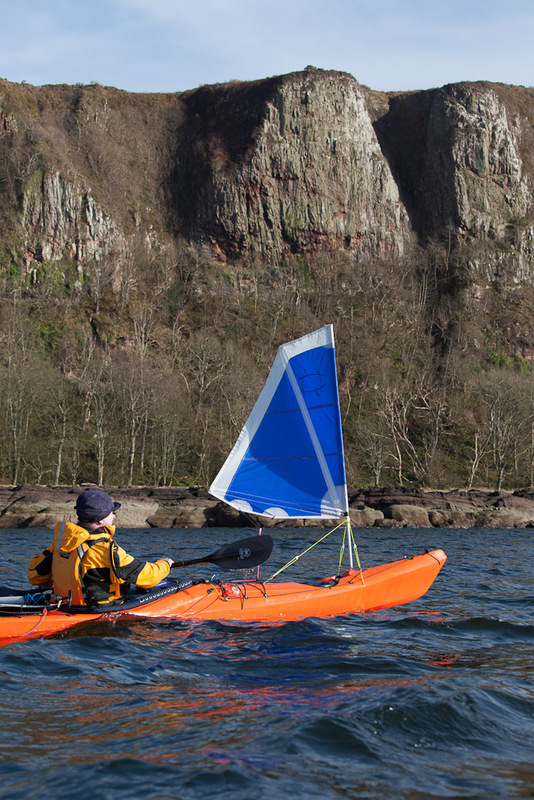 Yes, paddle sailing your sea kayak is a whole heap of fun, even though it might lead to excommunication!